The cards are of manila stock, being 71/8 inches in length by 31/4 inches, having a corner cut at the top right hand end. Along the bottom edge the numbers 1 - 80 identify 80 columnar positions. 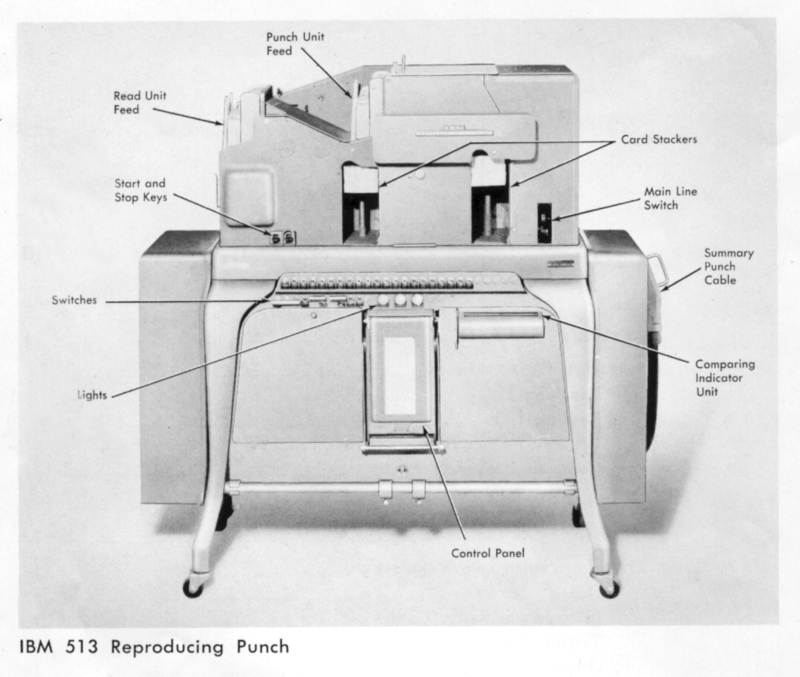 Each column can be utilised to record a digital value or a letter by means of a punched hole for a digit, or a pair of holes for a letter in the twelve available punching positions in a column. The 12 punch hole positions in a column from top to bottom are known as Y, X, 0, 1, 2, 3 ... 9 index levels. A single hole in a column in one of levels 0 - 9 obviously stands for the digital value so marked; a pair of holes in a column being used for alphabetical recording, where a "Y" hole in combination with any of 1, 2, 3 ... 9 stands for the letters A, B, C ... I; whereas an "X" hole in combination with 1, 2, 3 ... 9 gives letters J, K, L ... R. For the remaining letters of the alphabet a "0" hole in combination with 2, 3, 4 ... 9 gives letters S, T, U ... Z. In the alphabetical coding given above the "Y", "X", and 0 holes are said to be "zone" designators and the code as a whole is said to be a 4-zone code, three zones having been used for the letters A to Z, but the numerals alone are held to stand as a fourth zone. The "X" hole standing alone in a column can have a further function in that it is used as a designator to mark a card as a master card, carrying data to be transferred to detail cards, or to call a data distribution mechanism into operation.